Reviving the Living: Meaning Making in Living Systems presents a novel perspective that relates to current biological knowledge and issues. Written by polymath Dr. Yair Neuman, the book challenges the dogmas that frame our understanding of living systems and presents a radical alternative approach to understanding the world around us, one that avoids the pitfalls of non-scientific perspectives such as Vitalism and Creationism. 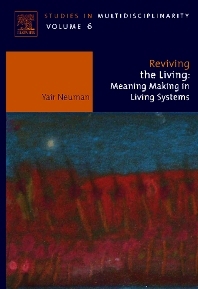 In this thought provoking and iconoclastic manuscript, Neuman follows the footsteps of Gregory Bateson, Mikhail Bakhtin, Michael Polanyi and others, to suggest that living systems are meaning making systems. The book delves into the unique processes of meaning making that characterize organisms as a unique category of nature, and offers new and fascinating insights into a variety of enigmatic biological phenomena from immune memory to hidden life (cryptobiosis). It consists of four parts divided into 18 chapters and covers topics ranging from reductionism and its pitfalls to genetics; why organisms are irreducible; immunology; meaning making in language and biology; meaning-bridging the gap between physics and semantics; context and memory; and the poetry of living. Core concepts and themes are illustrated using examples based in current science. This text would be of high interest to biologists, philosophers, cognitive scientists, psychologists, and semioticians, as well as to any reflective individual who is willing to examine the realm of the living from a novel and fascinating perspective. Poses thought provoking ideas for theoretical biologists, those studying philosophy of science and the mind, cognitive scientists, semioticians, and people involved with Artificial Intelligence. "Neuman's approach is an ingenious way to introduce an issue…" "A compilation of highly interesting topic that will undoubtedly transform the way readers think about organisms". Angewandte Chemie International 2009. "Neuman presents a fascinating analysis of biological interactions that aims to transcend the sort of billiard-ball model of causation that seems to be presupposed by the reductionists who are his target… Neuman has put the issues into what seems to be a more appropriate context, and that is a splendid accomplishment". Perspectives in Biology and Medicine 2009.